The art & architecture in the excavations of old Pompeii show what life was like for its citizens. Slideshow from the British Museum (answers Q1-4) Click on "download"
Videos, images & information. 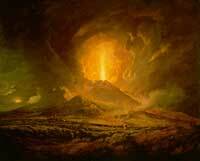 Investigate life in Pompeii, Mount Vesuvius, the events of 79AD and the rediscovery in 1748. 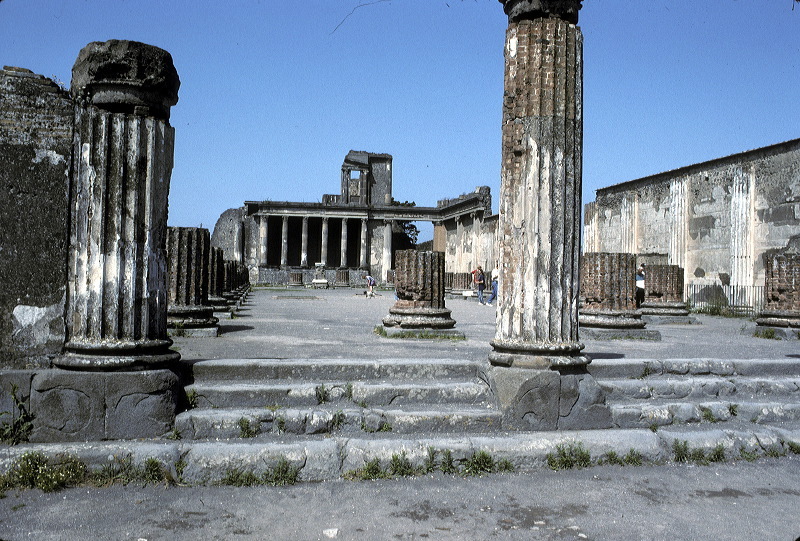 Images of the ruins of Pompeii. In A.D. 79, a massive eruption by Mount Vesuvius buried the town in ash, freezing it in time. What happened to Pompeii and Herculaneum? Mount Vesuvius, a volcano near the Bay of Naples in Italy, is hundreds of thousands of years old and has erupted more than 50 times. Its most famous eruption took place in the year 79 A.D., when the volcano buried the ancient Roman city of Pompeii under a thick carpet of volcanic ash. The dust “poured across the land” like a flood, one witness wrote, and shrouded the city in “a darkness…like the black of closed and unlighted rooms.” Two thousand people died, and the city was abandoned for almost as many years. When a group of explorers rediscovered the site in 1748, they were surprised to find that, underneath a thick layer of dust and debris, Pompeii was mostly intact. The buildings, artifacts and skeletons left behind in the buried city have taught us a great deal about everyday life in the ancient world. When did it happen? New evidence . . . SOURCE: ABC News (2018) Broadcast on Wednesday 17th October 2018, Rated G, Duration 1:36 mins. Archaeologists in Italy have uncovered an inscription they say may show that the history books have been wrong for centuries. Historians have long believed that Mount Vesuvius erupted on 24 August 79 AD, destroying the nearby Roman city of Pompeii, based on letters by Pliny, the Younger. But now, an inscription has been uncovered dated to mid-October - almost two months later. The inscription discovered in the new excavations is nothing more than a scrawl in charcoal, likely made by a worker renovating a home. But it is dated to 16 days before the "calends" of November in the old Roman calendar style - which is 17 October in our modern dating method. "Since it was done in fragile and evanescent charcoal, which could not have been able to last long, it is highly probable that it can be dated to the October of AD 79," the archaeology team said in a statement. They believe the most likely date for the eruption was, in fact, 24 October. There has long been some speculation that the eruption happened later than August, particularly centred around evidence of autumnal fruits and heating braziers discovered in the ruins. Interactive: Select each number in the floor plan to view a video tour by a expert archeologists from the 'Pompeii Forum Project.' 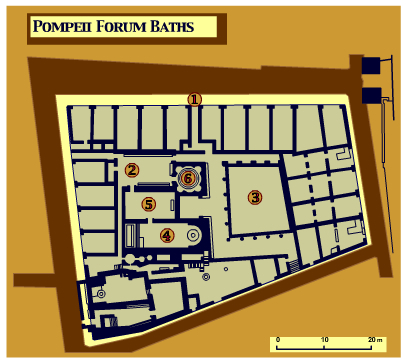 Use the links on the floor plan of the Baths to move from the Entrance to the Apodyterium (a-poe-die-tare-ee-um) or dressing room, the Palaestra (pal-eye-stra) or exercise courtyard, the Calidarium (cal-i-dar-ee-um) or hot room, the Tepidarium (teh-pi-dar-ee-um) or warm room, and the Frigidarium (fri-geh-dar-ee-um) or cold room.